Alvaro Bautista has raised the bar in WorldSBK but this year's Pirelli Thai Round was much faster across the field. WorldSBK commentator Steve English looks back on Buriram. Six races and six wins for Alvaro Bautista (Aruba.it Racing - Ducati) in 2019. It’s easy to look at the opening two rounds of the WorldSBK season and assess that we’ve traded one man’s dominance for another; in the Spaniard’s hands the brand new Ducati V4 R has moved the goalposts in the class. With Chaz Davies (Aruba.it Racing - Ducati) having made a step on Sunday - he had the pace for at least a top four finish prior to a technical problem in Race 2 - it’s clear that we should see at least two red machines at the front from now on. The package underneath the Ducati riders is clearly superb. 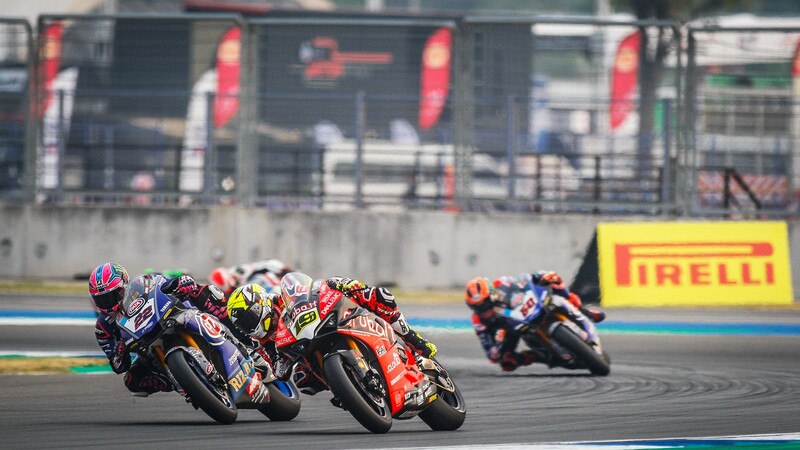 The bike was faultless in Sector 1 and 2 at Buriram, and took full control of any acceleration and top speed advantage that Bautista could find. In the second half of the lap however, there was little to separate the Ducati rider from his pursuers. Some of that can come from knowing that he had a gap behind and was looking to manage it, but some of the slow motion shots from the weekend show how hard he was pushing. There is a growing trend in saying that Ducati are getting the credit for Bautista’s success, and that the Spaniard hasn’t been given enough credit of his own. There doesn’t have to be an either/or in this argument. They don’t have to be mutually exclusive opinions to hold. Bautista has ridden faultlessly for two rounds and Ducati has hit the ground running with their all new V4 project. This is the newest Superbike on the planet and takes lots of the lessons learned from the Ducati MotoGP project to make an absolute weapon for the WorldSBK season. We’ll move on to Aragon for Round 3 of the championship with Bautista holding a 26 point lead over Jonathan Rea (Kawaskai Racing Team WorldSBK). With Davies rounding into some form and with the Yamaha’s looking stronger out the gate this year it’s clear that the field is getting more and more competitive. One bike might be doing the winning, but don’t underestimate how competitive WorldSBK can become this year. The easiest place to look for that is in the blue corner of Yamaha. From one year to the next Alex Lowes (Pata Yamaha Official WorldSBK Team) - a podium finisher last year don’t forget - cut over ten seconds off his race time. That’s an average of half a second per lap for the Yamaha rider. It’s hugely impressive to do that from one year to the next, and shows how much the WorldSBK field has stepped it up for 2019. In the Superpole session the top five riders were all underneath the lap record. Unfortunately for the field the biggest step that has been made is by Ducati. Lowes qualified third and finished third in all three races. It was a very competitive weekend from the Englishman and afterwards he talked about the “race within the race” behind Bautista in Thailand. Buriram is an interesting race to offer a comparison of the machinery in WorldSBK. We had the same three riders from three different manufacturers in the top three all weekend. The Yamaha was the slowest bike through the speedtraps; Lowes was, on average 10kmph slower than Bautista and this showed in Sector 1 and Sector 2, where he was losing over half a second per lap. The Yamaha R1 has a very good chassis and in the slower, technical second half of the lap it came into its own, with Lowes generally fastest of all through there. The final sector, which features the heavy braking zone into the last corner, saw all three riders pretty much recording identical times. It was three bikes making their lap-times in different ways but there wasn’t much to choose between them other than on the straights. That’s not to take anything away from Bautista, because you have to ride the bike you have. He made perfect use of his machinery and dominated in Thailand but for Lowes the improvements made by Yamaha over the winter were clear. Don’t miss the European rounds of the 2019 MOTUL FIM Superbike World Championship. Catch them all, with the WorldSBK VideoPass.